Kate Atkinson is somewhat of an unpredictable author for me — there are books of hers I haven’t liked at all, books that I’ve liked but that left no long-lasting impression, and then books of hers (two in particular over the last several years) that have made my all-time favourite books ever list. A God in Ruins, which is a companion volume to one of the favourite-books-ever, Life After Life, also makes the latter list. I found it absolutely engrossing and beautifully written. You may recall that Life After Life was what publishers and agents like to call a “high-concept” book — it’s the story of an Englishwoman named Ursula, born in the early years of the 20th century, who gets to live her life over and over again, gradually coming to realize that she is getting second chances and can change the outcome of her life. Ursula’s many lives unfold against the background of early 20th century England, particularly the London Blitz of WW2, in which she frequently (but not always) dies. Ursula has a brother she’s very close to called Teddy; Teddy is a bomber pilot in the war, and in almost every version of Ursula’s life story, he is killed in action. 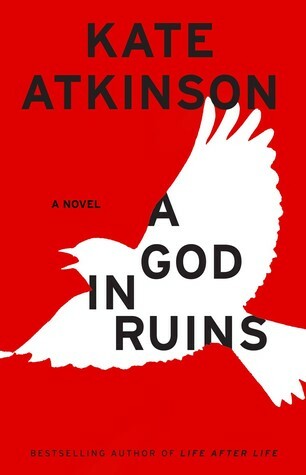 A God in Ruins is another version of the story — Teddy fights in the war, but survives a crash and time in a German POW camp, and goes on to live out his life (I was interested by the fact that he was born in 1914, just like my Aunt Gertie, and died at 98 in 2012, two years short of when she did; the idea of a life that spans all the social change of an entire century is fascinating in and of itself). There’s no high-concept, no magic realism, repeated lives or time travel in this book: it is a very straightforward story, in a way, of a single, realistic life. The only thing that makes it not straightforward is the narrative voice, which weaves in and out of the timeline of Teddy’s life at random, juxtaposing events from his young manhood with old age, and exploring the perspectives of several different characters, not just Teddy himself. Where Life After Life played with the possibilities of multiple lives, A God in Ruins examines, in beautiful prose, the layers, the twists, and the turns of a single, unique life. Very highly recommended.